It's easy to forget the dual role Rainwater Harvesting plays in improving the environment. One the one hand, RWH reduces the need for piped water supplies. This not only saves the customer money, but also saves municipalities money, water, and the power which is required to pump treated water to citizen's homes. But there is another benefit to the environment- a reduction in stormwater. 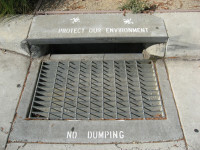 Stormwater is te rainwater that hits roofs and pavements before draining to the nearby storm drain. Stormwater is problematic because it carries with it all the oils, chemicals, and organic contaminants which cause pollution. This pollution usually winds up in earby creeks and bays causing all sorts of problems for wildlife. Stormwater also erodes the natural bodies of water it traverses particularly during flood conditions.